During October 2006, a salvage excavation was conducted in a private building plot on the hilltop of the Sandala village (Permit No. A-4924; map ref. NIG 23074/71429; OIG 18074/21429). The excavation, undertaken on behalf of the Israel Antiquities Authority and partially financed by the landowner M. Omri, was directed by Y. Alexandre, with the assistance of Y. Lavan (administration), A. Hajian (surveying), E. Belashov (drafting) and workers provided by the landowner. The small Arab village of Sandala is situated on a limestone hill at the western edge of the Gilbo‘a range. It has no local water source, but several rock-hewn cisterns are scattered around the village to collect rain-water. According to the villagers’ tradition, the present-day village was established in the Late Ottoman period, when two brothers of the Omri family emigrated here from Arane, a village near Jenin in the northern Samarian hills. 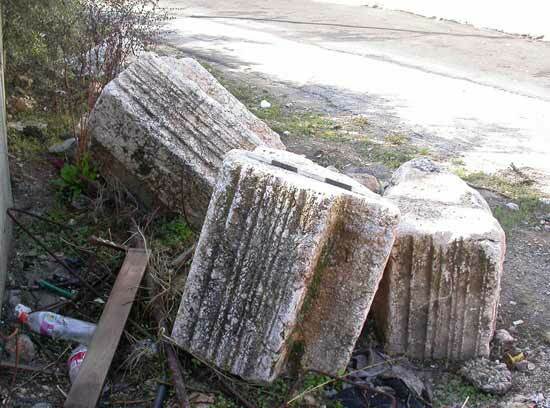 A Survey of Mount Gilbo‘a and the Jezre’el valley recorded some building remains and architectural elements of the Byzantine period and a decorated limestone sarcophagus and basalt millstones in the north of the village, as well as some rock-hewn agricultural installations spread over a larger area (Zori N. 1977, The Land of Issachar, p. 43 [Hebrew]). Two previous excavations at the site revealed a fill layer with a concentration of potsherds from the Early Islamic period in the center of the village (HA-ESI 120) and some ashlar masonry walls and two bell-shaped cisterns in association with Byzantine pottery adjacent to and northwest of the mosque (U. Ben Zioni, pers. comm.). The Byzantine building was overlaid with collapsed building stones and accumulated fill that contained some Ottoman potsherds. The present excavation was located directly adjacent to the village mosque on its eastern side. The stone walls of some of the old Ottoman houses were still standing in the immediate vicinity, although poorly preserved. They had been removed from the excavation area prior to its beginning. A single square (8 × 8 m) was opened, revealing stone walls that belonged to a large building of the Byzantine period, superimposed by some fragmentary remains of the Late Ottoman period. Some walls of worked limestone blocks were built on a thin layer of soil directly overlying bedrock (Fig. 1). The walls (W102, W102A, W106, W107, W110, W114 and W115) are contemporary and define four rooms (L104, L105, L108 and L112) of a single building (Fig. 2), whose orientation is exactly along the cardinal directions. 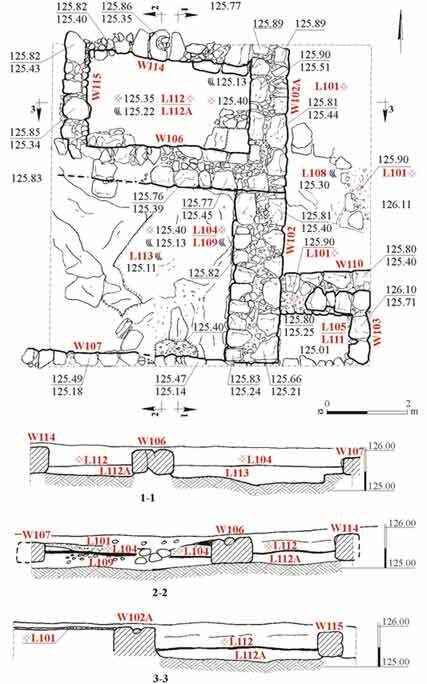 The walls (width 0.8–1.2 m), mostly built of two faces of worked stones with a core of small fieldstones (Fig. 3), are preserved one–two courses high (0.3–0.5 m). A small row of stones (W103) that created a corner seems to be a remnant of a later addition. A facing layer of small stones and mortar was preserved on the eastern face of W115. Room 112 (c. 2.5 × 4.0 m) was enclosed by four walls (102A, 106, 114, 115) with a possible entrance in W106, although this was not clear. The floor (L112a) of packed earth was overlain with a few potsherds, including a black bag-shaped storage jar with white lines, typical of the Byzantine period. Room 104 (4 × 5 m) had a thicker layer of brown packed earth (thickness c. 0.3 m) that contained a significant quantity of ash, charcoal, plaster and a few Byzantine potsherds. This room may have been a courtyard. Rooms 105 and 108 contained stone collapse, but no floors overlying the uneven bedrock were preserved. The few potsherds on the bedrock and in the collapse could be dated to the Late Byzantine period. No coins and only a few tiny glass fragments were found. The location of the building at the top of the hill and the width of the walls suggests that the remains were part of a large, public building. 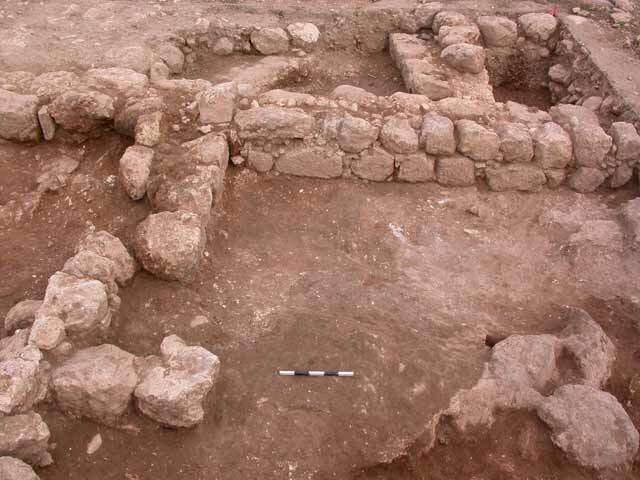 Similar wide walls exposed in the adjacent excavation, c. 25 m away (U. Ben-Zioni, pers. comm.) raises the possibility that these walls may have been part of a single large building complex. The orientation of the walls exactly along the cardinal points and the dating to the Byzantine period may imply that the building was a church. Additional support for this interpretation is provided by a pile of four finely carved architectural elements found in the immediate vicinity (Fig. 4). A few centimeters below surface some patches of packed tiny stones with mortar and plaster (L101) were uncovered directly above the wall tops of the Byzantine building. The few potsherds found in association with these floor patches dated to the Ottoman period. This floor thus belongs to the Late Ottoman building that was demolished and removed prior to the current excavation. 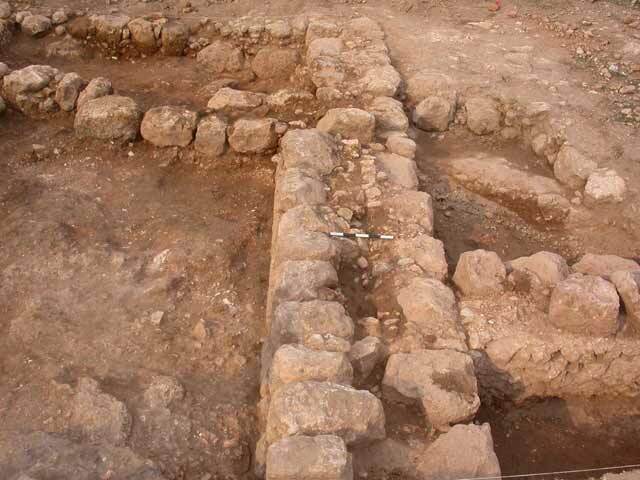 The archaeological remains exposed in the excavation point to the existence of a large building at the site during the Byzantine period, possibly a church. Subsequent to the abandonment of the Late Byzantine period village, the site was not reoccupied until the Ottoman period. The limited periods of occupation at the site can be clearly attributed to the marginal nature of the region and the absence of a water source. 4. Architectural elements in vicinity of excavation.